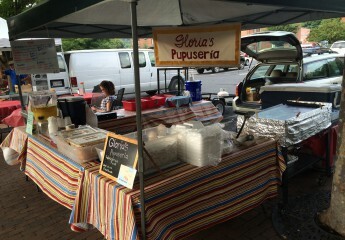 Gloria's Pupuseria | Serving Pupusas and other Salvadoran style food in Staunton and Harrisonburg! Great delicious food! Friendly people! Give them a try, you will be coming back for more! Thanks Lucy!! Look forward to seeing you again!! Will you be open tomorrow, Wednesday 12/23? Yes! We’ll be on Lewis from 11-6pm! Where will you be on Thursday June 30? And what times? We are closed for prep on Thursday! 😕 I’m sorry! Will you be open on labor day? Great choice for dinner. Looking forward to eating here again. Like tomorrow. The chicken pupusas were amazing!! The first “authentic” food I’ve had since moving from Arizona back to the area. I will definitely come back! Absolutely loved the veggies and cheese!